"Ghost Bunny?" queried Lapinette. "We’re back," wailed Ghost Bunny. "Hello! Welcome home," shouted Skratch. "How did you know where to find us?" said Lapinette. "I saw it in a dream," purred Skratch. "A small white rabbit with a big book appeared and advised me to go to the Motor Museum, where I would find something to my advantage." "That would be me," called the Wabbit. Skratch watched the Wabbit carefully and addressed Lapinette. "The Wabbit’s to my advantage?" he asked. "I am," said the Wabbit. Skratch snorted but then he smiled and his tail quivered. "Where is he going?" said Lapinette to Ghost Bunny quietly. "I’m going to look over a Bugatti," said the Wabbit. "I think that trip went to his head," whispered Lapinette. "No, no," called the Wabbit and he climbed onwards. "It’s all in the book!” he muttered, but everyone heard him even though it was under his breath. "That book is all advanced mathematics," said Lapinette. "Indeed!" cried the Wabbit. "This is one of many possible worlds and in every possible world there’s always a Motor Museum." "He’s winding us up," said Skratch. "He does that," said Lapinette. "It’s his way," said Ghost Bunny fondly. "It would be nice if his way met our way from time to time," said Lapinette. "Then he wouldn’t be the Wabbit," said Skratch. 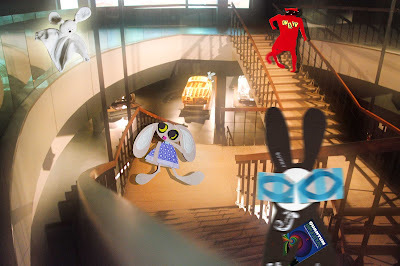 "Come on everyone, there’s a great snack bar nearby," called the Wabbit. "His way just met my way," said Lapinette. "And mine," said Skratch. "I therefore suggest we follow the Wabbit," said Ghost Bunny. So they did.